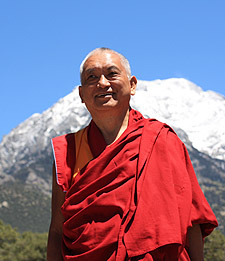 Lama Zopa Rinpoche in Crestone, Colorado, USA, June 2008. Khadro la and Dagri Rinpoche (joined here by young Tenzin Phuntsok Rinpoche) went to Nepal in June to do long life retreat for His Holiness in the Maratika cave where Guru Rinpoche is said to have attained immortality. When they completed this they also wanted to pass the blessings of the retreat onto Lama Zopa Rinpoche. So they requested Rinpoche to accept a special long life puja whereby the blessings of long life are passed on. Rinpoche accepted and it was done in Rinpoche’s room in Kopan along with Khen Rinpoche Lama Lhundrup (left) and the senior monks of Kopan. During the puja, $1000 was offered to Rinpoche on behalf of all the FPMT centers and Ven. Roger offered a large Chenrezig thangka. Rinpoche recently wrote to a new center director to thank them for offering service in this way and to help them generate the most beneficial attitude – this advice is not only deeply helpful for each of us (especially current center directors and spiritual program coordinators! ), it is also indicative of how enormously beneficial it is to offer service in this way. humble. One should always think that one is the servant and others are leaders. Others are most precious and kind, are from whom I receive all my past, present and future happiness, liberation from samsara, the peerless happiness of enlightenment. See more advice for Center Directors at the Lama Yeshe Wisdom Archive. Rejoice! The long life puja offered every year on behalf of the FPMT organization to His Holiness was offered on June 15th in Sydney, Australia – with enormous thanks to organizer Kathy Vichta, and thank you to all who made offerings for His Holiness’ long life. Ian Green (Chairman of the organizing committee for the teaching, and also director of the Great Stupa of Compassion in Australia) and Kathy tell us, “The long life offering during the recent wonderful teachings with His Holiness went very well. All the offerings were very beautiful and although the actual ritual was very quick (in accordance with His Holiness’ wishes), people seemed to have a good experience and were quite moved. Look out for photos in the next issue of Mandala! Now is the time for centers to think about their future interpreter needs, and for those keen to learn Tibetan in a deep and effective way to consider applying. LRZTP director Ven. Lhundup Chodron writes: “The Lotsawa Rinchen Zangpo Translator Program (LRZTP) is FPMT’s program for training non-Tibetans of all nationalities to become Tibetan interpreters and to ensure that the teachings can be delivered directly into the native language of the country. The LRZTP is a four year program, 2 years spent learning Tibetan (colloquial, some honorific, Dharma terms and the written language) in Dharamsala, India, followed by 2 years studying and working as an interpreter to a resident geshe in an FPMT center. The LRZTP is widely recognized as an effective program for fast, intensive training in the Tibetan language, and specifically for training as an interpreter for the Dharma. The previous four LRZTP programs have successfully trained 22 graduates, 14 of whom are currently providing the essential service of bringing Tibetan geshes’ teachings to their students in FPMT centers worldwide. The deadline for applications to study in LRZTP is July 31, 2008. The Office of His Holiness the Dalai Lama have given a very clear, updated overview of the Shugden issue, which they have asked be circulated to all FPMT centers to use as the main advice and response to questions about Shugden. The FPMT website has more background on this issue, together with the updated advice from His Holiness’ Office. 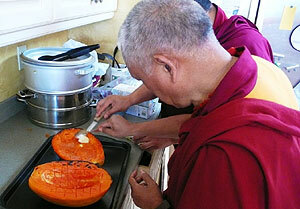 Rinpoche cooking his specialty dessert (baked papaya and cream) for Choden Rinpoche when he visited Rinopche’s house in Aptos, California. Rinpoche has given a name and details for making this snack: Loving Kindness – Cut a papaya in half, lengthwise. Scoop out the seeds and bake face down on a pan. When baked, scoop out papaya and mix with butter and honey. Serve hot. Wonderful News! Lama Zopa Rinpoche has decided how to disburse the funds donated to the Merit Box in 2007! This was the first year that FPMT centers, projects and services were able to apply for grants. There were 15 applications submitted from 11 different centers. Over $89,000 was donated to the Merit Box in 2007 – please take this opportunity to rejoice in the extraordinary merit created by the participants in the Merit Box Project. Also rejoice in the merit created by those receiving grants as they apply them to worthy Dharma projects in their local communities. If you are interested in a grant application for the 2008 cycle, please contact Chuck Latimer. Merit Box kits are available by donation from the Foundation Store. Many of you may have heard that the Education Services was planning to develop a new program entirely based on the teachings of Lama Yeshe and Lama Zopa Rinpoche, with special emphasis on how to meditate on the path. Last month we hosted a meeting to brainstorm what such a program would look like. The result… we will not be creating a new program from scratch and will instead revise, update, and improve the already excellent Discovering Buddhism (DB) program. As the initial mandate of DB was to preserve the teachings of Lama and Rinpoche we’ll be working very closely with the Lama Yeshe Wisdom Archive and senior FPMT teachers to infuse the program more with the teachings of the Lamas and particularly with meditation instruction. Kendall Magnussen, who was the project manager of DB, has accepted to come back onboard as the project manager of the New DB, while Heather will remain the project manager of the existing program. We will keep you posted on all developments. Please keep an eye on the Trainings page of the website for the schedule of 2008/2009 FPMT Service Trainings. So far it looks like there will be an SPC Training held at Mahamudra Center in late November 2008. We are still working out the details of further Foundation and Rituals trainings. We hope you have had the opportunity to visit our membership page. Foundation Membership enables the visions of Lama Yeshe and Lama Zopa Rinpoche by supporting educational programming for all levels of practitioners, charitable projects that preserve the Mahayana tradition, and center services that promote the transmission of the Dharma in the communities worldwide. Membership includes an exclusive subscription to Mandala Magazine, a discount at the Foundation Store and other gifts. We invite you to consider Foundation Membership. For more information, contact our Membership Coordinator, Sandra Peterson, at friends@fpmt.org, +1 503.808.1588 x 126. A great feature about Ritual, and why we have them, is in the August-September issue of Mandala, due out around July 10. Also read how ordination can mean being caught between two cultures. A reminder that this year International Sangha Day is on August 5th, which is the special meritorious day marking the First Turning of the Wheel of Dharma. We encourage you and your community to organize a Sangha-related activity to deepen the understanding between lay people and Sangha. The Sangha, by taking vows of renunciation, living in morality and having the space to focus on the Dharma, are an integral part of maintaining the existence of the Buddha’s teachings. From the side of the Sangha, International Sangha Day is a time to reflect on the kindness of those who have made the teachings available. It is also a time to remember the kindness of the community in helping to create conducive conditions to maintain ordination vows. Also, we would like to encourage FPMT centers and students to support the IMI Sangha by making a contribution to the Lama Yeshe Sangha Fund on International Sangha Day. The Lama Yeshe Sangha Fund was established to help support the monks and nuns of the IMI community to engage in study, retreat and service. By contributing to the fund you will be enabling more monks and nuns of our organization to receive support and thereby benefit others. August 5, 2008 commemorates the day when Buddha Shakyamuni first turned the Wheel of Dharma, and is a day when virtuous actions are multiplied a million-fold. Between now and August 5th, we invite you to join the World-Wide Recitation of the sublime Sutra of Golden Light. By reciting the Sutra during this period, you are joining with FPMT IMI Sangha members, who are reciting the Sutra during this period as August 5th also marks FPMT International Sangha Day. The new Ordination Guidelines from IMI are now available in Tibetan for geshes resident in FPMT Centers. On May 21st, Khen Rinpoche Lama Lhundrup invited FPMT students to participate in the Pledge to Avoid Killing during the month of Saka Dawa. As the merit of virtuous activities during this month is multiplied by a million, it was an excellent opportunity to accumulate merit, purifying karma, and benefit many sentient beings. Of the 195 respondents, 58 (nearly 30%) pledged to be vegetarian for the rest of their lives, 15 pledged for one year and another 77 chose to be vegetarian for the whole month of Saka Dawa. Fourteen participants pledged to keep precepts for the month, another 8 will keep precepts on all Buddha and precept days for the rest of their lives and 25 people have pledged to be vegetarian on all Buddha days for one year. The participants dedicated all the merit they accumulated to the long lives of His Holiness the Dalai Lama, Lama Zopa Rinpoche, Lama Osel Rinpoche, and all their own gurus, to increase the teachings of the Buddha in general and especially the Mahayana teachings, to remove all the problems in countries experiencing war, famine, and violence of any kind, to increase peace in the world, and to remove all obstacles to the return of His Holiness to Tibet. Ven. 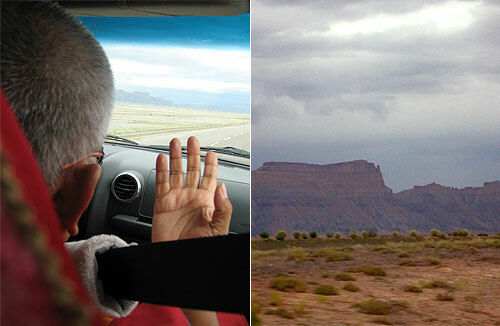 Holly Ansett writes of the 1200 mile drive from California to Crestone, Colorado, USA (where Rinpoche was giving teachings): “Rinpoche would often start chanting and doing mudras. Rinpoche explained afterwards that he was consecrating the mountains, so they become holy objects. All the buddhas and bodhisattvas absorb into the mountain and then it becomes a holy object so that anyone who sees the mountain, drives around the mountain, any person who climbs on the mountain receives blessing and by even driving around one creates so much merit.” This mountain somewhere in Utah is now a holy object. Now many of us understand that using electricity, and any form of energy that comes from fossil fuels, is contributing to climate change. Climate change has already brought suffering and death to millions of living beings including many humans. And this is going to increase, so compassionate living needs to include a reduction in our use of energy as much as possible. The first step is to switch off at the socket all appliances, phone chargers, standbys, etc., which all consume power while on standby. (Someone estimated that if everyone in UK did this, we could close 2 coal-fired power stations! If anyone has similar calculations for other countries, please let me know!) Next, put on a woolly jumper in winter and turn down the heating. Buy beautiful thick warm Tibetan sweaters, and help support Tibetan refugees economically. At the same time, the reduction in energy use/reduction in Co2 emissions is protecting corals, and poor people in New Orleans and Bangladesh who have already suffered from the results of climate change. Insulate the house as much as possible, and switch to an electricity supplier which guarantees to provide you with renewable electricity. Opportunities include volunteering at Root Institute, India and both Nalanda Monastery in France and Land of Medicine Buddha, USA are looking for an experienced cook.